On the world of Arroway, witches have been persecuted for a thousand years. 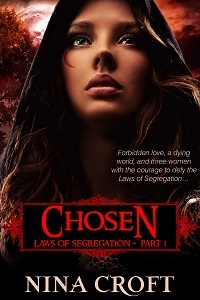 Now, Tallon, Enforcer for The Order of Warlocks has been sent to hunt and destroy Shayla, a powerful, young witch. But when he sees her, she awakens something inside him—some connection forgotten in the years of persecution. And when he starts his spell, she counters with magic so strong it rips them from their own world and into a new one—Earth. Drawn together as unlikely allies in this strange new world, Tallon and Shayla must work as partners to find a way home. They relearn the bond that long ago tied witches and warlocks as one, and in doing so discover that not only is their future at stake, but the future of their whole world.